Spider tattoos are tattoos drawings of most watched and sought after, we see in traditional tribal tattooing in many indigenous cultures around the world. Few cultures have no stories about the spider in its mythology, probably because spiders can be found almost anywhere in the world, even on isolated islands, because the spiders are able to travel long distances using his paintings as a of "parachute." 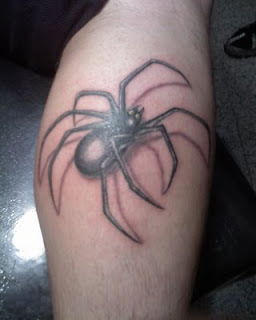 The spider tattoos have special meaning within the prison culture and language of the bands, spiders and spider webs can provide information about the length of prison sentence and even about their crimes. In popular culture today, the spider and its web are also a treacherous force. One need only watch as the spider accounts for the innocent victims caught in her web to realize that it is a deadly blood sucker. It is therefore not surprising to find carnivorous spiders comics, games and horror stories. Spiders conjure up in our imagination the terror of being caught, and anyone who likes horror stories is necessarily a fan of spiders. Spiders can "bite" or "bite, and bite of some species can be fatal. The fearsome tarantula, the largest member of the family of spiders, is actually a very quiet animal, an affable giant. The Native American stories tell of the "spider woman", a creature that existed at the dawn of creation, before humans appeared on earth. No wonder that she was taught men the art of weaving. Today, the spider is a symbol of fertility, balance and harmony, is often depicted as "Grandma", teacher and protector of wisdom and knowledge. The spider is already recorded on clay in Native American prehistory. You can take the mark of the spider as a symbol of creativity and ingenuity, and when you find her hanging from somewhere, as a symbol of good luck, because there is a belief that when you "pick" brings happiness from the heaven. According to this legend, Athena makes life so miserable that Arachne's finally dies. Athena's remorse is so great that raises Arachne in the form of a spider, so she can weave beautiful fabrics for all eternity. In Europe, the spider has a particularly bad reputation, a consequence of the superstitions originated during times of pestilence and plagues, when it was believed that the spiders spread these diseases. Because of these popular beliefs became a feared and hated animal. For some people, pathological fear of spiders becomes a medical case, a phobia called "arachnophobia", which gets its name from the myth of the young Greek weaver. But be very careful with the "Black Widow", a small spider the size of a pea, whose sting can be fatal. You can recognize it by its characteristic red markings on the abdomen. This spider venom is one of the most powerful in the animal kingdom.